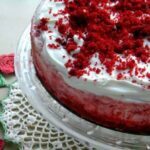 Bright pieces of red velvet cake are stirred in to a creamy cheesecake batter and then poured onto a red velvet crust. Sift sifted flour, cocoa powder, baking powder, baking soda, and salt into a bowl. Blend the buttermilk, food coloring, vinegar, and vanilla in another bowl . Beat the sugar and butter in large bowl until light and fluffy. Add eggs 1 at a time, beating well blended after each addition. Beat in dry ingredients in 3 additions alternately with buttermilk mixture in 2 additions. Put about 1/4 inch of cake batter in the bottom of a greased and floured 10 inch springform. Use the rest of the batter in a 13x9 or 9 inch cake pan. Bake both pans for about 20 minutes or until a toothpick comes out clean. Cool in pans about 5 minutes and turn out to cool completely. Break the larger cake (NOT the one in the springform) into large chunks and set aside. Beat the cheesecake ingredients together until smooth. Reserve about 1/2 cup cake crumbs for the top. Fold the remaining cake chunks into cheesecake batter. Cover the bottom of the springform (the one with the cake layer in it) with aluminum foil, bringing it up the sides. Place pan in larger pan of hot water. Water should come halfway up the sides. Turn oven off and leave door closed for 1 hour. Don’t PEEK! Remove from oven, take out of bain marie. Let come to room temperature and cover tightly. Whip the heavy cream until it starts to thicken. Add the teaspoon of instant pudding mix and 1 tablespoon of sugar. Spoon on top of cooled cheesecake. Sprinkle with reserved red velvet cake crumbs. If you're in a hurry use a store bought red velvet cake. Not as good but it works fine in a pinch!